Imagine living on a private lane just three houses from beautiful Kailua (Oahu) beach in a sparkling, spacious (3300 sq. ft.) fully equipped executive home! 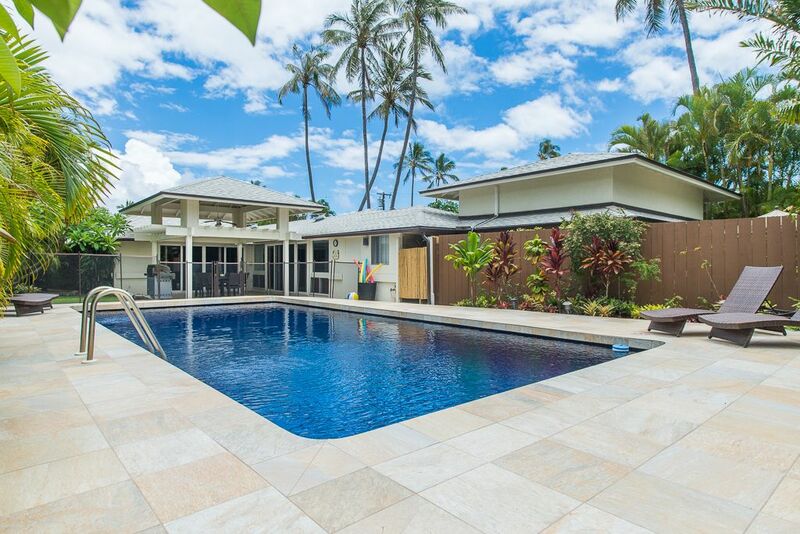 Its modern kitchen, huge newly tiled pool, deck and covered lanai, new tropical furnishings and lovely gardens reflect the gracious Hawaiian living that has made the islands famous. This quiet residential lane with wonderful, friendly neighbors is why we specialize in families. There are just 7 homes, and the lane ends at the locked beach gate. This adds additional safety for your children, and of course we give you a key. We have a photo-voltaic system to minimize our carbon footprint. Air conditioned throughout, you will love our huge family and living rooms that open to the pool and yard. The new custom kitchen reflects our open island living with views of the pool, living and family areas. And, it is fully stocked with quality cookware, utensils and a starter supply of paper goods and fresh fruits for when you decide to to cook in and/or use the large stainless gas grill instead of eating out in Kailua's outstanding restaurants. You can relax knowing that your little ones are safe, for in addition to being fully fenced, we will put up our Guardian Pool Fence for all families with non-swimmers and children under 6.No matter which door they go through, they cannot reach the pool. From fresh flowers and boogie boards to a blender for tropical drinks, nearly everything is provided for your perfect Hawaiian family vacation. We focus on the details that are important to you! Past president of the Rotary Club of Honolulu Sunrise, Carolyn is active in a variety of community service activities. She is a recently retired technology teacher for K-5 students at an (pk -12) Independent International Baccalaureate-certified World school right here in Kailua. In her spare time, Carolyn enjoys walking on the beach, traveling, and spending time with family. This has been our family home since 1971, but I started the vacation rental in 1987 as the children grew up and and moved away to start college. It became a perfect opportunity to keep and maintain my home while meeting interesting people from around the world. This is a quiet residential lane with wonderful, friendly neighbors. This is why we specialize in families. There are just 7 homes, and the lane ends at the locked beach gate. This adds additional safety for your children, and of course we give you a key. The private outdoor hot/cold shower is everyone's favorite. See photo! Newly upgraded to split air systems in all the bedrooms and living room. Garage parking for 2 cars. See size limits. Two car garage with automatic garage door. Ask owner for details. We have a high-speed fiber-optic internet system with additional hubs to reach every room. 5 Flat-screened TV's: master bedroom 43 inch, queen bedrooms 40 inch, twin bedroom 38 inch each, and family room 43 inch. We have a wireless network. We have a speaker for your use. Please ask. We have beach toys and books for the children. Relax and enjoy your vacation. As an added safety precaution, the attractive Guardian Pool Fence will be installed for all families with non-swimmers and children under 6. There are beach mats and chairs, Boogie boards, Children's beach toys, full-sized crib, Pack-N-Play, and high chair. 4 bedrooms have flat-screen TV's. During our 6 week stay at Hiatt Hale, the property exceeded our expectations in all ways. Right from our initial greeting with Carolyn when she insisted that we treat her home 'like it was our home', ...she was always on hand to promptly manage any needs yet maintained a distance respecting our privacy. Each room was fully equipped with the latest amenities from the fully stocked kitchen to the premium bath products. Each bedroom had new TV's installed. The house was perfectly suited for the variety of guests that we invited, from our children and grandchildren to relatives and close friends. We always had a full house but never felt crammed for space. The recently renovated pool was a hit after spending the day at the beach. The beach was like your own private beach, merely steps away from the house. Kailua supplies all your shopping needs from food stores, coffee shops, restaurants (we loved the daily catch at Nico's just down from the house) medical facilities and curio shops. Hiatt Hale is surrounded by multi million dollar homes being built along the beach. The area is very safe.... you can stroll any evening without concern or watch the sun rise in the early morning. Honolulu and Waikiki is a short 25 minute ride on 3 super highways. The scenery was stunning with lush vegetation covering the mountains and the beautiful turquoise and blue water surrounding Oahu. We highly recommend this luxurious executive home where you can feel like you're in your own home from the moment you step through the door. House was amazing the weather was amazing I couldn’t ask for a better family vacation. House was amazing the weather was amazing I couldn’t ask for a better family vacation. Carolyn is a wonderful host! This multi-generational family was respectful of the house and neighborhood. As every home on our lane has owners in residence, I truly appreciated their efforts to follow our house rules and fit in so seamlessly. A beautiful home that is spacious and comfortable. Steps to the beach made it so nice with our toddlers. Carolyn made our experience so easy and was always available for anything we needed. Absolutely recommend this home for family vacations!! This delightful and respectful family enjoyed our beautiful winter (clear and cool 69-73ºF) weather with long beach days and family pool time. They fit right into our quiet neighborhood and I am looking forward to a return trip. A lovely home which was enjoyed by all the members of our family. The pool was very popular with the grandchildren as was the beach which was a short stroll from the house. Plenty of supplies and Carolyn had everything we needed! The rear room with trundle was smaller than what we thought but still worked with two young adults and futons are suited for children not adults. Location was excellent and worked well between going to North Shore and Waikiki. Water at the beaches are a little brown and not like Waikiki with blue waters but still lovely to hang out or walk each day. We had family stay with us in the same street at 2 different houses and worked well with 17 of us all getting together. The pool was great to have and well looked after with plenty of pool toys etc. We enjoyed many laid back afternoons outside by the pool after busy days exploring too. Would stay again..very spacious and easy! This delightful family was quiet and left the home so clean that it almost seemed like no one had ever been here. I do want to comment on the "brown water." Normally, Kailua has beautiful aqua water, but due to recent heavy rains (that were so heavy that the H3 to Honolulu had to be closed) the runoff from the Kaiwainui Marsh caused brown water on the beach. I lamented the ugly surf with other local sunrise beach walkers, but neglected to mention it to my guests. We were traveling with our extended family (six adults, two kids and a baby) all the way to Hawaii to find a really great home and a perfectly nice and courteous owner. We spent a whole month there hanging by the pool, surfing, body boarding, walking on the beach, soaking the sun, hiking and doing a lot of other great stuff...Kailua is a beautiful place and the house owner knows all its secrets and places you shouldn't miss. Canoes, stand-up paddle boarding, kite surfing are nearby. 1. 'Beach side' does not mean 'Beach front.' 'Beach side' *should* mean that the home is on the beach side of Kalaheo Avenue and there will be no streets to cross to get to the beach. Please ask the property owner if there are any streets to cross to get to the beach. 2. A 'Beach Front' home is actually on the beach. 3. 'Ocean Front' in Kailua means there are only rocks in the front of the property and there is no beach. You will need to drive to get to the beach. 4. 'Ocean View' means that you will have a view of the ocean, but the home is likely up on a hillside. 1. Do I have to cross any streets to get to the beach? 2. Is there a private beach right-of-way for my use? If not, how far is the public right-of-way? 3. Will we be the only renters on the property?